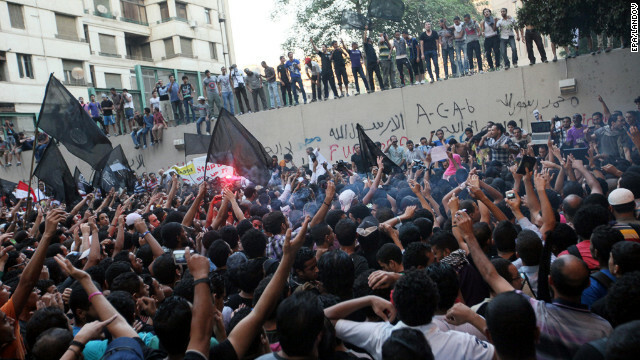 Protesters rally in front the U.S. Embassy in Cairo, Egypt, on Tuesday. [Updated at 5:38 p.m. ET] Angry protesters climbed the walls of the U.S. Embassy in Cairo on Tuesday and tore down the American flag, apparently in protest of a film thought to insult the Prophet Mohammed. A volley of warning shots were fired as a large crowd gathered around the compound, said CNN producer Mohammed Fahmy, who was on the scene, though it is not clear who fired the shots. Egyptian police and army personnel have since formed defensive lines around the facility in an effort to prevent the demonstrators from advancing farther, but not before the protesters affixed their standard atop the embassy. The black flag, which hangs atop a ladder inside the compound, is adorned with white characters that read, "There is no God but Allah and Mohammad is his messenger," an emblem often used in al Qaeda propaganda. It was unclear which film upset the protesters. I am surprised that any educated person is surprised by the ongoing violence in Muslim lands. Muslim nations have been teaching hatred, especially hatred of the United States (to them "The Great Satan") , ever since the United States cast the deciding vote in the United Nations to create the state of Israel. There can be no peace on earth so long as almost 30 percent of the earths inhabitants are taught to hate. Hatred begets violence and violence begets more violence--so here we go!